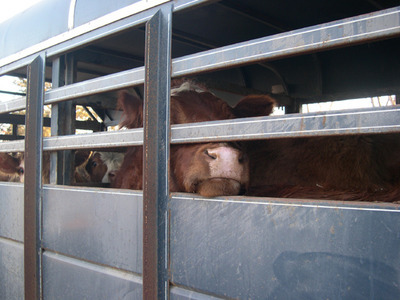 On Friday we had another adventure in cattle. We took 2 old cows and a bunch of young steers & heifers to the sale barn. "Home again after a full day at the office, got fuel and washed the Durango, then hurried home to help a sleep-deprived Farmer hook up the trailer. We got hooked up and I changed into my lovely too-big knee high irrigation boots, bright turquoise blue jacket accessorized with dark green fleece gloves. I was lovely. I was only missing my usual gray scarf tied around my ears and neck. It was too warm for that. We backed the trailer to the gate w/ minimal grousing. (I said, Turn EAST!!) 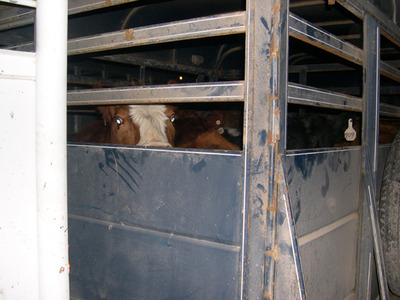 The 2 older cows hopped on the trailer easily. I felt a bit deceptive. I think they thought we were taking them to their summer pasture home. I guess I should think about how they will be in the happy pasture in the sky very soon, right? All loaded, gates stored, everyone fed who needed feeding and watering and clothes changed. 1.5 hour drive to the sale barn, where we waited in line to unload. It will be a big sale tomorrow (Saturday). While we were waiting, all of a sudden, a large red steer comes galloping by the pickup! I had just been gazing at the sturdy wooden fence that borders the parking lot and separates it from the main road, golf course and nearby residential area (the city/town has grown up around the sale barn.). I was sitting there wondering if they had ever had any cattle escape, and had the fence contained the animals. And here is one going wild next to me! Men came running, from pickups (other farmers/ranchers) and from loading shoots and from ??? This steer has it in it's head to go through that fence! A young guy hurdled the fence to keep it in and off the road. That pisses the steer off, big time!! It had it's head down and was pawing and stomping the ground and I really thought that poor kid was toast! 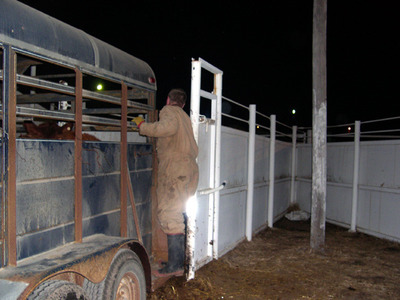 I could just see the steer going through the fence and through, over, & dancing on the kid. About that time, a pick-up came roaring by and the pickup and kid got the steer corralled in the hay barn at the edge of the property. From there I don't know what happened but I assume they got it back in a reinforced pen. Wild! After finally getting unloaded and all ours documented, we headed back home. We stopped in our hometown for supper in a freezing cold Pizza Hut! It's hard to eat when you are stiff, but shaking with cold. We turned the heater up to "Blast Furnace" when we got back in the truck and headed home. 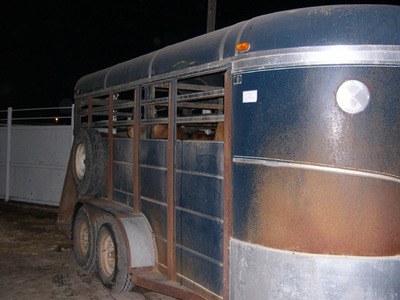 The trailer was parked in it's shed and we got all snuggled in and warmed up!" Let's see if I can get the photos linked in here.... I'm having trouble with my photo editor so I may have to save this and come back to do it. "Will you STOP taking pictures of me!" "Can you see where you are going??" On Saturday, we did various house-hold and farm chores before we went back up the sale and picked up our check. The cattle sold pretty well, according to my Farmer. He was happy with what they brought. The rest of day was spent driving to different farm stores and implement dealers looking for a no-till drill. I brought along a couple of magazines to read and I did get lunch "out". It was so nice to just enjoy the day together, talking and singing along with the radio. We also stopped by our favorite furniture store and looked at several different reclining couches but in the end we decided to wait. We have some ideas & plans for the kitchen for this year and I'd rather work towards that end first. Besides, I'm not sure what I want to do in the living room when we renovate it in a few years and our current reclining love-seat is fine. It's just not a full-sized couch. I think I want a red couch but I'm not 100% sure yet. After we got home, we chored and spent the evening watching a movie and doing laundry.